For pages which discuss more than one work, see Online Essays and Criticism. A Brief History of Western Culture - Brief but cogent analysis of The Abbot, concentrating on the theme of disguise. Wikipedia - Very brief entry on The Abbot (as at March 2007) offering a plot outline and a note on the fictional editor Captain Clutterbuck. William Leighton Leitch as a Monk in Sir Walter Scott's The Abbot - From George Easton House's Photography Collections Online, a photograph by D.O. Hill and Robert Adamson (taken ca. 1843) of the artist William Leighton Leitch in the character of a monk (probably Father Ambrosius, Abbot of Kennaquhair). William Leighton Leitch as a monk in Sir Walter Scott's The Abbot - From George Easton House's Photography Collections Online, a second photograph by Hill and Adamson (taken ca. 1843) of William Leighton Leitch in the character of a monk. John Leich [sic] - From George Easton House's Photography Collections Online, a third photograph by Hill and Adamson (taken ca. 1843) of William Leighton Leitch in the character of a monk. 'Anne of Geierstein' - From the Maybole home page (a community site for Maybole, Ayrshire), a colour portrait of the heroine of Scott's novel Anne of Geierstein extracted from an unidentified nineteenth-century edition of the novel. Wikipedia - Very brief entry on Anne of Geierstein (as at March 2007) offering a plot outline and list of external links. A Brief History of Western Culture - Brief but cogent analysis of The Antiquary, focussing, in particular, on the absence of a central thread and on the themes of dilettantism and conversation. The Squashed Version of The Antiquary - A radically condensed and abridged version of the novel from Glyn Hughes's Squashed Writers, which offers 'all the books you think you ought to have read, in their own words... but magically Squashed into half-hour short stories'. Wikipedia - This entry provides (as at March 2007) a detailed plot summary of The Antiquary, a brief discussion of its debt to Gothic fiction, a list of characters, and links to relevant webpages. Sir Walter Scott and The Antiquary - From Bellrock.org.uk ('A reference site for Stevenson's Bell Rock Lighthouse'), this page refers to Scott's visit to Arbroath in 1814 while on a tour of Scottish lighthouses and his subsequent decision to set The Antiquary around Arbroath. It includes a critical analysis of the novel by Nicola Watson. Edie Ochiltree's Grave, Roxburgh - From the visitor information site Discover the Borders, a page on the carved gravestone of Andrew Gemmels, the 'gaberlunzie man', who died at the age of 106, and upon whom Scott is though to have based the character Edie Ochiltree in The Antiquary. Together with a photograph of the gravestone, the page gives directions and information on visiting hours. John Henning as Edie Ochiltree - From the Getty Museum, an image of a photograph by D.O. Hill and Robert Adamson (taken ca. 1846-47) of the sculptor John Henning in the character of Edie Ochiltree, the mendicant in The Antiquary. John Henning as Edie Ochiltree - From George Easton House's Photography Collections Online, a further image of the photo described immediately above. John Henning as Edie Ochiltree - From George Easton House's Photography Collections Online, a second photograph by Hill and Adamson (taken ca. 1846) of John Henning in the character of Edie Ochiltree. John Henning as Edie Ochiltree in Sir Walter Scott's The Antiquary - From George Easton House's Photography Collections Online, a third photograph by Hill and Adamson (taken ca. 1846) of John Henning in the character of Edie Ochiltree. John Henning and Mrs. Cleghorn as Edie Ochiltree & Miss Wardour - From George Easton House's Photography Collections Online, a photograph by Hill and Adamson (taken ca. 1846) of John Henning in the character of Edie Ochiltree and Mrs Elizabeth Cleghorn (daughter of Lord Cockburn) in that of Isabella Wardour, the heroine of The Antiquary. Miss Cockburn, John Henning - From George Easton House's Photography Collections Online, a second photograph by Hill and Adamson (taken ca. 1845) of John Henning in the character of Edie Ochiltree and Mrs Elizabeth Cleghorn in that of Isabella Wardour. Hospitalfield House - From Angus Council's Local History site, this page describes (with accompanying images) Hospitalfield House, the model for Monkbarns in The Antiquary. Wikipedia - Very brief entry (as at March 2007) on The Betrothed offering some notes on the novel's negative critical reception and links to external sites. Manor (Parish) - An article from the Imperial Gazetteer of Scotland (1868), hosted by RootsWeb, which identifies the parish's greatest attraction as the cottage of the 'Black Dwarf', home to the reclusive David Ritchie, on whom Scott partially modelled the titular character of The Black Dwarf. The Parish Kirkyard also contains a monument to Ritchie's memory. Wikipedia - Brief entry (as at June 2008) on The Black Dwarf, providing a plot summary, a general introduction to Tales of My Landlord, and a list of external links. Wikipedia - Very brief entry (as at March 2007) providing a plot outline and a note on the real-life episode which inspired the novel. A Hyper-Concordance to the Works of Walter Scott - From The Victorian Literary Studies Archive, includes a concordance to The Bride of Lammermoor. Gaetano Donizetti: Lucia di Lammermoor - From Italian Opera, an Italian-language page on Donizetti's 1835 operatic version of The Bride of Lammermoor which gives details of the first performance and provides a synopsis of the plot. Lucia di Lammermoor - From the opera information directory OperaGlass, this page offers links to pages on the composer Donizetti, librettist Salvatore Cammarano, and performance history, to e-texts of the libretto and source text, to synopses and to a discography. Lucia di Lammermoor - From Paul F. Zweifel's home page, programme notes for Donizetti's 1835 opera Lucia di Lammermoor, highlighting the areas where the libretto departs from the source text, Scott's The Bride of Lammermoor. Baldoon Castle - From the Bladnoch Distillery site, an extract from Peter Underword's Gazetteer of Scottish and Irish Ghosts (1973) which describes the wedding night of Janet Dalrymple and David Dunbar at Baldoon Castle near Wigtown, an episode on which Scott based the conclusion to The Bride of Lammermoor. Baldoon Castle - From the tourist information site VisitSouthernScotland.com, a page on Baldoon Castle, discussing its role as a historical setting for The Bride of Lammermoor (see above) and providing full visitor information. Baldoon Castle - From Haunted Places in the UK, a page on Baldoon Castle, in which the events of Janet Dalrymple's wedding night are told from her own perspective. Famous Haunted Places: Baldoon Castle - From Angels & Ghosts, an account by Walter Bissell of the wedding night of Janet Dalrymple and David Dunbar (see above) which quotes from Scott's fictional elaboration of the episode in The Bride of Lammermoor. Janet Dalrymple's ghost is reputed to haunt the castle. Nunraw Past and Present - From the Nunraw Abbey Homepage, this page by Fr. Michael Sherry OCSO includes a discussion of Nunraw's claim to be recognised as the 'Ravenswood' of Scott's The Bride of Lammermoor. The Fair Maid of Perth's House - From McGonagall Online, a site devoted to the Poetic Gems of William McGonagall, 'widely hailed as the writer of the worst poetry in the English language'. This 'gem' celebrates the house of Catherine Glover, Scott's model for The Fair Maid of Perth. Wikipedia - Very brief entry on The Fair Maid of Perth (as at June 2008) which provides a plot outline, points out the historical anomaly which sees Rothesay die six years earlier in the novel than in real life, refers to Bizet's operatic adaptation La jolie fille de Perth (1867), and gives a list of external links. 'The Fortunes of Nigel: A Fragment from my Common-Place Book' - From Dickinson College Chronicles, an e-text of the March 1849 issue of The Collegian which includes a review essay on The Fortunes of Nigel. The anonymous reviewer stresses Scott's 'unyielding attachment to feudalism'. Wikipedia - Very brief entry (as at March 2007) offering some information on the narrative framework, the first sentence of the novel, and a short list of external links. Reflections on Great Literature - From David C. Lahti's site, this page offers a synopsis of the novel, brief analysis, significant quotations from the text, and recommendations of other books that an admirer of Guy Mannering might enjoy. The Squashed Version of Guy Mannering, or The Astrologer - A radically condensed and abridged version of the novel from Glyn Hughes's Squashed Writers, which offers 'all the books you think you ought to have read, in their own words... but magically Squashed into half-hour short stories'. Wikipedia - Brief entry (as at June 2008) on Guy Mannering offering a plot summary, list of characters, and links to e-texts and other relevant websites. Border and Frontier: Tourism in Scott's Guy Mannering and Cooper's The Pioneers - From the James Fenimore Cooper Society site, this essay by George G. Dekker (Stanford University) was originally published in James Fenimore Cooper Society Miscellaneous Papers, 9 (Aug. 1997). It discusses how Guy Mannering inspired Cooper to an act of emulation and rivalry in The Pioneers (1823) and focuses particularly on how characters in the two novels react to their physical and human environment as tourists. 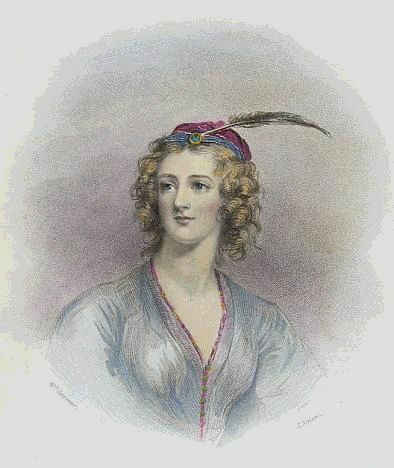 Charlotte Cushman as Meg Merrilies - From Cushman & Allerton Genealogy, a site hosted by RootsWeb, an image of an engraving first published in the Theatrical Times (London), September 5, 1846, showing American actress Charlotte Cushman (1816-76) in the role of Meg Merrilies in an adaptation of Guy Mannering. The Wikipedia entry for Cushman has a photograph of the actress in the same role. Dandie Dinmont Terrier - From Dog Cart Art, a site featuring images of pre-World War II cigarette cards devoted to breeds of dogs, a page of cards portraying the Dandie Dinmont terrier. The accompanying texts note that the breed is named after a character in Guy Mannering. Dandie Dinmont Terrier - From Saúde Animal (a Brazilian site devoted to animal health), this Portugese-language page describes the breed named after the character in Guy Mannering with information on Dandie Dinmont's real-life 'model', James Davidson. Dandie Dinmont Breed History - From Montizard Dandie Dinmont Terriers, a dog-breeding site, a page on the history of the Dandie Dinmont Terrier, which describes how Scott helped popularize the breed through the success of Guy Mannering. 'Meg Merrilies' - From Representative Poetry Online, one of many available e-texts of Keats's ballad 'Meg Merrilies' inspired by the gypsy character in Guy Mannering. The Squashed Version of The Heart of Midlothian - A radically condensed and abridged version of the novel from Glyn Hughes's Squashed Writers, which offers 'all the books you think you ought to have read, in their own words... but magically Squashed into half-hour short stories'. Wikipedia - This entry (as at March 2007) provides a brief compositional history, a plot summary, a list of characters, and links to external sites. A Hyper-Concordance to the Works of Walter Scott - From The Victorian Literary Studies Archive, includes a concordance to The Heart of Mid-Lothian. The Heart of Mid-Lothian - From Digital Memories, an online newsletter featuring historical artefacts from the Department of Special Collections, University of Idaho Library, this page reproduces an engraving by William Forrest after a painting by Samuel Bough, depicting the scene in Chapter 15 of The Heart of Mid-Lothian where Jeanie Deans goes to a moonlit meeting with George Staunton near the cursed spot of Muschat's Cairn. Originally published as one of Six Engravings in Illustration of The Heart of Midlothian (Edinburgh: Royal Association for Promotion of the Fine Arts in Scotland, 1873), the engraving was reproduced in the 1898 'Border Edition' of the Waverley Novels, from which the University of Idaho Library's image was made. The accompanying text discusses the development of book illustration in the second half of the nineteenth century and Scott's impact on the visual arts. The Luckenbooths - JK Gillon's page on the Luckenbooths ('locked booths') in Edinburgh's High Street, which were the centre for trade in the city until their demolition in 1817, includes a descriptive passage from The Heart of Mid-Lothian along with a number of nineteenth-century prints. Ivanhoe by Walter Scott - From Richard Crawford's Gallery pages, this page provides information on Scott and Ivanhoe with particular emphasis on the treatment of its Jewish characters. There are links to e-texts of Ivanhoe, to other Scott-related sites, and to sites dealing with medieval England. MonkeyNotes: Ivanhoe - From MonkeyNotes Study Guides, this page offers information on 'Key Literary Elements' (Setting, Characters, Conflict, Plot, Themes, Mood, Background Information, Literary Information, Historical Information), chapter summaries with notes, an 'Overall Analysis' (in terms of characters, plot, themes, and style), a list of study questions and a link to a discussion board. Sparknotes Study Guide - These pages provide a plot summary, biographical account of the author, discussion of the novel's historical background, dictionary of characters, and critical analysis. They are marred by biographical inaccuracies, typographical errors, and questionable critical judgment. The Squashed Version of Ivanhoe - A radically condensed and abridged version of the novel from Glyn Hughes's Squashed Writers, which offers 'all the books you think you ought to have read, in their own words... but magically Squashed into half-hour short stories'. Wikipedia - Detailed entry (as at June 2008) providing a plot summary, lists of characters, of allusions to real history and geography, and of allusions made to Ivanhoe in other works, a discussion of the novel's contribution to the image or Robin Hood, an assessment of its historical accuracy, a comprehensive list of film, TV or theatrical adaptations, and links to external sites. The Hermit in Lore: Walter Scott's Ivanhoe' - From The Hermitary ('Resources and Reflections on Hermits and Solitude'), this essay essays both medieval and Scott's own attitudes to eremiticism with reference to Ivanhoe, noting some of the anachronisms in the portrayal of Friar Tuck. 'Tra letteratura classica e SF: chi ha copiato da chi?' by Giuseppe Iannozzi - From Intercom: Science Fiction Station, this Italian-language essay by Giuseppe Iannozzi includes a discussion of the influence of Ivanhoe in the development of fantasy literature. It is illustrated by images of a card game based on Ivanhoe. 'Walter Scott, Postcolonial Theory, and New South Literature' by Peter J. Schmidt - Originally published in the Mississippi Quarterly, 56 (2003), 545-54, this essay discusses the importance of Scott's Ivanhoe for US Southern culture, both before and after the Civil War. Professor Schmidt is Chair of the Department of English Literature at Swarthmore College. Click here for a fuller précis. Rebecca Gratz: Ivanhoe Legend - From the Jewish Women's Archive site, a page on the tradition that Scott's Rebecca was based on the American Jewish philanthropist Rebecca Gratz. A Hyper-Concordance to the Works of Walter Scott - From The Victorian Literary Studies Archive, includes a concordance to Ivanhoe. Ivanhoe by Arthur Sullivan - From The Gilbert and Sullivan Archive at Boise State University, this page is devoted to a romantic opera based on Scott's novel which was first staged in 1891. There are links to a full libretto, midi files of the music, a downloadable vocal score, an introductory essay, notes on the music, a plot summary, a discography, and accounts of various productions of the opera. Sullivan's Ivanhoe - From Webrarian, an extensive 1977 essay by Chris Goddard on Sir Arthur Sullivan's Ivanhoe, placing the opera within its historical context, plotting a compositional history, analysing both libretto and music, and providing a detailed account of the first production. 'The Disinherited Knight's Challenge' - From Stephen Railton's Mark Twain in His Times site, an illustration from the 1893 Dryburgh edition of Ivanhoe, accompanying a piece on Scott's popularity in the ante bellum American South. Olga's Gallery: Sir Walter Scott (1771-1832) - From Dr Olga Mataev's Olga's Gallery site, this page contains a clickable image of Eugène Delacroix's painting The Abduction of Rebecca together with a plot summary of Ivanhoe. Yorkshire's Castles: Conisbrough Castle - From h2g2, an interactive encyclopaedic project run by the BBC, this page quotes Scott's description of Conisbrough Castle in Ivanhoe (where it features as the home of Athelstane). It describes the role played by Conisbrough Castle in Scott's novel and quotes an extract from Scott's correspondence recalling his first vision of the castle through the window of a mail coach in 1801. Sir Walter Scott: Ivanhoe y la Arquería - From Prof. Dr. Guillermo E. Bahamonde's Arrow News - Archery Museum site, this Spanish-language page collates all the references to archery in Ivanhoe. IVANHOE Game - Developed by Jerome J. McGann and Johanna Drucker at the University of Virginia, the IVANHOE Game is 'an online playspace that facilitates collaborative interpretation'. It 'calls attention to interpretation as active intervention in a textual field and promotes self-conscious reflection by returning various visual and textual transformations to the players'. Permitting players to perform or to modify Scott's novel-making decisions, IVANHOE is specially apt for use in small group situations. The Squashed Version of Kenilworth - A radically condensed and abridged version of the novel from Glyn Hughes's Squashed Writers, which offers 'all the books you think you ought to have read, in their own words... but magically Squashed into half-hour short stories'. Wikipedia - The entry on Kenilworth provides (as at June 2008) a brief plot summary, list of themes, and note of historical inaccuracies..
A Hyper-Concordance to the Works of Walter Scott - From The Victorian Literary Studies Archive, includes a concordance to Kenilworth. Gaetano Donizetti: Il castello di Kenilworth - From Italian Opera, an Italian-language page on Donizetti's 1829 opera Il castello di Kenilworth, or, Elisabetta al castello di Kenilworth with a libretto based on Scott's Kenilworth. Details are given of the first performance and links are included to e-texts of Scott's novel. Victor Hugo: Amy Robsart - This collection of Hugo e-texts, published by the Académie de Strasbourg, includes the French-language text of Hugo's 1828 play Amy Robsart which was based on Scott's Kenilworth. The introduction includes an extract from Adèle Hugo's biography of her husband which traces the genesis of the piece. Walter Scott: Kenilworth - From the Tegneseriemuseet i Danmark (The Comics Museum of Denmark), an illustration from a comic-book version of Kenilworth. Robsart - From Saskatchewan Ghost Towns, an account of a settlement founded in 1910 and named after Amy Robsart, heroine of Kenilworth. The settlement declined during the Great Depression and is now home to only a handful of residents. Wikipedia - Brief entry (as at March 2007) providing a plot summary and links to relevant external sites. A Lost House: Cairncross of Colmslie - From the Cairncross Family Web Site, a reprint of a 1905 article by the Rev. T. S. Cairncross about Comslie Tower near Melrose. The article quotes the introduction to the Magnum Opus edition of The Monastery where Scott denies any real resemblance between Colmslie (and the neighbouring towers of Hillslap and Langshaw) and his fictional Glendearg. It also discusses Scott's citation of an extract from a traditional ballad on Colmslie. 'Roadside Meeting' by Albert Pinkham Ryder - From The Butler Institute of American Art, an image of an oil painting by Albert Pinkham Ryder (1847-1917) depicting the meeting of Stawarth Bolton and Elspeth Glendinning in Chapter 2 of The Monastery. Transcendental Aesthetics: The Golden Waters - Reprinted by The Victorian Web, this is the opening chapter of Paul L. Sawyer's Ruskin's Poetic Argument: The Design of the Major Works (1985). It discusses Ruskin's love of The Monastery, his favourite childhood book, themes from which reappear throughout his work. Wikipedia - Very brief entry (as of March 2007) offering a plot outline and list of main characters. Sir Walter Scott, 'My Aunt Margaret's Mirror' - From Histoire de la Télévision/History of Television, this page discusses 'My Aunt Margaret's Mirror' as one of a number of texts illustrating the age-old desire to see what is distant. It provides publications details and a précis (in French), a lengthy extract (in English) and an external link to an e-text. A Brief History of Western Culture - Brief but cogent analysis of Old Mortality, arguing that Scott's attempt to write 'as fairly as he could about a movement to which he was unsympathetic' is thwarted by an 'insidious manipulation' which gently but continuously slants his reading of Covenanting history towards an emasculation of opposing views. The Squashed Version of Old Mortality - A radically condensed and abridged version of the novel from Glyn Hughes's Squashed Writers, which offers 'all the books you think you ought to have read, in their own words... but magically Squashed into half-hour short stories'. Wikipedia - Brief entry (as at March 2007) providing a plot summary and list of relevant external links. 'Past Masters' - From things magazine, an article by Jane Stevenson on the 'antiquarian instinct', which identifies Scott as the originator of 'Highland Picturesque' in Waverley and discusses the controversies sparked by Scott's attempt to give the Covenanting period an antiquarian treatment in Old Mortality. Thomas McCrie, Review of Tales of My Landlord, Christian Instructor, 1817 - From the Scottish Preachers' Hall of Fame, a page on Thomas McCrie's powerful defence of the Covenanters in his review of Old Mortality, with extracts from the correspondence between McCrie and Andrew Thomson, editor of the Christian Instructor, which led to the publication of the review. Vincenzo Bellini: I puritani - From Italian Opera, an Italian-language page on Bellini's 1835 opera I puritani which is very freely inspired by Scott's Old Mortality. The page provides details of the first performance and a synopsis of the plot. Draffan - From Malcolm Hutton's Family History hosted by RootsWeb, this page discusses how Scott based Tillietudlem Castle in Old Mortality on Craignethan Castle in Lanarkshire (built on the site of the earlier Draffan Castle). It describes how a railway station named 'Tillietudlem' was subsequently built near the castle and how a village of that name grew up around it. The Squashed Version of Peveril of the Peak - A radically condensed and abridged version of Peveril of the Peak from Glyn Hughes's Squashed Writers, which offers 'all the books you think you ought to have read, in their own words... but magically Squashed into half-hour short stories'. Wikipedia - Very brief entry (as at March 2007) offering a plot outline and notes on the novel's reception. Illiam Dhône and the Manx Rebellion, 1651 - From A Manx Note Book, this is an e-text of a volume printed by the Manx Society in 1877 which gathered authentic archive material on the rebellion against the Earl of Derby, Lord of the Island, an episode depicted in Scott's Peveril of the Peak. The preface by editor William Harrison discusses Scott's treatment of the rising and its leader Illiam Dhône (or William Christian). Bygone Altrincham: The Town in 1800 - From the genealogical Balshaw Name Web Site, an extract from Charles Nickson's Bygone Altrincham (1935) which quotes Scott's description of the Cheshire town in Peveril of the Peak. Peveril Castle, Derbyshire, UK - From h2g2, an interactive encyclopaedic project run by the BBC, a page on a castle which Scott uses as a setting in Peveril of the Peak. It notes how the interest created by Scott's novel led to the renovation of the castle. El Pirata de Walter Scott - From Gilichorradas, a Spanish-language blog by M. Imbelecio Delatorre which provides a brief compositional history and précis of The Pirate and praise for the 1923 Spanish translation by Catalan journalist Eugenio Xammar. Wikipedia - The brief entry on The Pirate provides a plot outline and list of characters (as at March 2007). John Gow - From the Fea Family Website, a biographical page on John Gow, 'the Orkney Pirate' which notes Scott's departures from the historical account when recasting Gow as Captain Cleveland in The Pirate. James Fea, an ancestor of the site editors, was instrumental in Gow's capture. John Gow, the Orkney Pirate - From the heritage site Orkneyjar, a biographical page on the pirate John Gow (ca 1698-1725) who is thought to be the model of Captain Cleveland in Scott's The Pirate. Bessie Millie - From the genealogical site Ancestral Orkney, a paragraph on the Stromness 'witch' Bessie Millie who was reputed to sell favourable winds to sailors. She is said to have been visited by Scott during his 1814 visit to Orkney and to have inspired the character of Norma of the Fitful Head in The Pirate. She is also thought to have provided Scott with an account of the life of John Gow whom she claimed to have known. Brims Family History: Myths and Legends - This page refers to the tradition that Brims Castle, near Thurso, Caithness, was the model for Jarishof in The Pirate. The Standing Stones o' Stenness: Sir Walter Scott's 'Sacrificial Altar' - From Orkneyjar, a site dedicated to preserving, exploring and documenting the ancient history, folklore and traditions of Orkney, this page discusses Scott's description of the Standing Stones in his 'Essay on Border Antiquities' (1814). Scott's contentious claim that the central stone slab originally formed part of a sacrificial altar eventually led to the 'altar''s reconstruction in 1907. The 'altar' was dismantled in mysterious circumstances in 1972. The Stones also feature in The Pirate. A Brief History of Western Culture - Brief but cogent analysis of Quentin Durward which suggests that 'Scott’s interest in royalty [may be] associated with a determination to view the behaviour of a human when untrammelled by institutions'. The Squashed Version of Quentin Durward - A radically condensed and abridged version of the novel from Glyn Hughes's Squashed Writers, which offers 'all the books you think you ought to have read, in their own words... but magically Squashed into half-hour short stories'. Wikipedia - This entry offers (as at March 2007) a plot summary, list of characters, list of film, TV, and theatrical adaptations, and links to external sites. Le Roi se meurt - From the online newspaper L'Alsace/Le Pays, a French-language page on the evil reputation of King Louis XI which discusses Scott's contribution to his legend in Quentin Durward. Redgauntlet, by Angus Allan - From Animus Web, a site devoted to cult TV, this interview with cartoonist Angus Allan covers his work for Look-In magazine (the 'Junior TV Times') and includes an illustration from a 1971 strip based on a TV adaptation of Redgauntlet. Allan recalls that 'putting complex plots like those of Walter Scott into a running picture serial was like being in hell'. Wikipedia - This entry offers (as at March 2007) a plot summary, a discussion of 'Wandering Willie's Tale', a list of allusions/references to actual history, geography and current science, and links to external sites. A Brief History of Western Culture - Brief but cogent analysis of Rob Roy as 'an interesting kind of failure', stressing the excessive delay before the narrative reaches the Highlands and lack of any vital plot connection between Frank Osbaldistone and Rob Roy Macgregor. The Squashed Version of Rob Roy - A radically condensed and abridged version of the novel from Glyn Hughes's Squashed Writers, which offers 'all the books you think you ought to have read, in their own words... but magically Squashed into half-hour short stories'. Wikipedia - This entry (as at June 2008) contains a brief compositional history and plot summary, a list of 'cultural references' including links to entries on film adaptations of the novel, and links to external sites. Sir Walter Scotts Familial History in Rob Roy - From A 19th-Century BritLit Web, a collaborative work-in-progress produced by students and faculty at Cedar Crest College and West Chester University, this essay by student Jody Kilpatrick (Cedar Crest College) examines autobiographical subtexts in Rob Roy. Rob Roy MacGregor (or McGregor) - From the tourist information site InCallander, a biographical page on Rob Roy MacGregor, including a lengthy extract from Picturesque Scotland (1883) by Francis Watt and Andrew Carter. Clan Gregor Burial Sites - From Clan Gregor International, this page includes clickable images of photographs of Rob Roy's Grave and 'The Heart of Midlothian' and of a portrait of Roderick Dhu by Howard Chandler Christy taken from a 1910 edition of The Lady of the Lake. Rob Roy in Northumberland - From Louis Stott's Blog, this essay discusses Scott's knowledge of Northumberland and his portrayal of the country and of the Northumbrian Jacobites in Rob Roy. In particular, it considers the competing claims of Chillingham Castle and Biddlestone Hall to be considered the models for Scott's Osbaldistone Hall. The Rob Roy Way - A site tracing a seven-day walk across the Southern Highlands, following the tracks and paths used by Rob Roy MacGregor in the 17th and 18th centuries and noting locations featured in Scott's novel Rob Roy. Innerleithen - From VisitScotland.com, the official site of the Scottish Tourist Board, a page noting the identification of Innerleithen with the eponymous fictional spa-town of Saint Ronan's Well and its consequent development as a tourist attraction. The town is home to the St. Ronan's Well Interpretative Centre, which houses a display on the history of the spa and on its links with Burns, Scott, and James Hogg. Innerleithen (Parish) - From GENUKI, the UK and Ireland genealogical site, this entry from the Imperial Gazetteer of Scotland (1868) includes two paragraphs on the village of Innerleithen which note its emergence as a tourist destination following its identification with Scott's Saint Ronan's Well. Wikipedia - Very brief entry (as at March 2007) on Saint Ronan's Well, offering a plot outline, a list of significant characters, and a characteristic quotation from Meg Dods. The Squashed Version of The Talisman - A radically condensed and abridged version of The Talisman from Glyn Hughes's Squashed Writers, which offers 'all the books you think you ought to have read, in their own words... but magically Squashed into half-hour short stories'. Wikipedia - This entry offers (as at March 2007) a plot summary, a discussion of major themes, and a list of external links. The Literary Encyclopedia - Detailed entry by Nathan Uglow (Leeds Trinity & All Saints), outlining Waverley's compositional history and plot and providing a critical analysis which sees Scott enriching the formulaic narrative of the turn-of-the-century ‘perils of the imagination’ genre with geographical, political, and historical resonance. Reflections on Great Literature - From David C. Lahti's site, this page offers a synopsis of the novel, brief analysis, significant quotations from the text, and recommendations of other books that an admirer of Waverley might enjoy. Wikipedia - Detailed entry (as at June 2008) providing a plot summary, lists of characters, major themes, allusions/references (to other works, history, geography and science), an assessment of the work's literary significance, and a brief account of its critical reception. 'The Celtic Muse in Walter Scott's Waverley' by Christopher Rollason - From Silicon Glen, an internet guide to Scotland, an article by Christopher Rollason which highlights Scott's depiction, in the middle section of Waverley, of the strength and vitality of traditional culture (both Highland and Lowland), and, in particular, folk poetry and music. Argues that the exposure to traditional culture forms an often overlooked part of Edward Waverley's learning process. 'Edward Waverley: The Child of Caprice' by Jeremy Davis - From LiteratureClassics.com, an essay by an undergraduate student which argues that Waverley 'is an ambivalent text, seeking to chart a way between extreme positions (cultural as much as political)'. 'Past Masters' by Jane Stevenson - From things magazine, an article on the 'antiquarian instinct', which identifies Scott as the originator of 'Highland Picturesque' in Waverley and discusses the controversies sparked by Scott's attempt to give the Covenanting period an antiquarian treatment in Old Mortality. Waverley Hypertext - Edited by Andrew Monnickendam (Universitat autònoma de Barcelona), this site provides a critical reading of Waverley, together with information on Scott's literary-historical context, his predecessors, contemporaries, and successors, his major critics, and the most vital critical issues. It provides a good list of Scott-related links and e-texts. Berlioz's Grande Ouverture de 'Waverley' - From D. Kern Holoman's Berlioz 2003/UC-Davis site (devised to celebrate the bicentenary of Hector Berlioz's birth), this page provides a compositional history and analysis of the French Romantic composer's Waverley Overture (first performed 1828). Waverly: A Baltimore Neighborhood - From Drexel University, these pages contain a short history of the Waverly neighbourhood in North Baltimore. It was initially settled in the middle of the nineteenth century, as a small village, which also contained the summer homes of wealthy Baltimoreans. Originally called Huntington, the neighbourhood was renamed Waverly [sic] in honour of Scott. A Brief History of Western Culture - Brief but cogent analysis of Woodstock stressing the fugal structure of the narrative. Wikipedia - Very brief entry (as at March 2007) offering a plot outline, notes on sources, and a list of external links. The Adelphi Theatre 1806-1900: The 1891-1892 Season - From The Adelphi Theatre 1806-1900: A Calendar of Performances, a site maintained by members of Eastern Michigan University English Department, this page discusses The White Rose, an adaptation of Scott's Woodstock by George R. Sims and Robert Buchanan. It provides a synopsis and an account of a review in Theatre. The Pigeon Pie by Charlotte M. Yonge - From the Charlotte Mary Yonge Fellowship Website, a project providing scholarly and general information on an overlooked Victorian writer, this page provides publication details, a summary, and a bibliography for Yonge's 1880 novel The Pigeon Pie with links to an online text. The summary suggests that The Pigeon Pie was written as a corrective to Scott's Woodstock, presenting the Royalist cause in a less ambiguously positive light. A Tribute to Jorstadt Castle (now 'Singer Castle') - From Patty Mondore's Home Page on Gold Mountain, a personal tribute page to a castle built between 1902 and 1904 on Dark Island in Upstate New York for Commodore Frederick Gilbert Bourne, fourth President of the Singer Sewing Manufacturing Company. The architect Ernest Flagg, who also designed both the Singer Building in New York City, modelled his design on the description of the royal hunting lodge in Woodstock Park in Scott's Woodstock. A video and book on the Castle are also available from the site. Singer Castle on Dark Island - Official site providing visitor information on Singer Castle which was modelled by Ernest Flagg on a description in Scott's Woodstock (see above). The site provides a brief history of the building and numerous images. Singer Castle (formerly Jorstadt Castle) - From Castles of the United States, a page on Singer Castle (see above) collating information on the castle which was modelled by Ernest Flagg on a description in Scott's Woodstock. Wikipedia - Entry on the song, adapted from Scott's lyric, which is the authorized regimental march for a number of Canadian regiments. It gives the text of the song, of the original lyric by Scott, and of parodies by Lewis Carroll and Rudyard Kipling. The Literary Encyclopedia - Detailed entry by Susan Oliver (Essex/Wolfson College, Cambridge), outlining the compositional history of The Lady of the Lake, its plot and critical reception, and providing a critical commentary. Wikipedia - This Wikipedia entry on the Arthurian legend of the Lady of the Lake includes a paragraph on Scott's poem of that name with a discussion of the musical adaptations by Rossini and Schubert and links to e-texts. A Hyper-Concordance to the Works of Walter Scott - From The Victorian Literary Studies Archive, includes a concordance to The Lady of the Lake. Annual Review of Schubert's Life: 1825 - From the Schubert Institute (UK), this page describes Schubert's setting of seven of the songs embedded in Scott's The Lady of the Lake, possibly inspired by Donizetti's operatic version of the poem La donna del lago. Schubert in Gmunden - From the Homepage of Tomoko Yamamoto, photographer, composer, and soprano, a page on Schubert's settings of seven songs from The Lady of the Lake which were first performed in Gmunden, Austria, in 1825. Lavishly illustrated with images of the town, the page includes a synopsis of the poem. 1825-26, On Tour, Gmunden Symphony, Scott Songs - From the Schubert Institute (UK), Chapter 7 of Joseph Bennett's 1886 biography of Schubert, which includes a discussion of Schubert's settings of songs from The Lady of the Lake. Loch Katrine - From Clan Gregor International, a guide to the tourist attractions of Loch Katrine with clickable images of photographs and nineteenth-century prints of locales made popular by The Lady of the Lake. There are links to a page on the steamship 'SS Sir Walter Scott' and to a text of William McGonagall's poem 'Loch Katrine'. Loch Katrine Steamship, Sir Walter Scott - From the InCallander Trossachs tourist information site, tells the story of the S.S. Sir Walter Scott which has sailed the waters of Loch Katrine since 1900 and describes the role of Scott's The Lady of the Lake in establishing the Loch Katrine tourist trade. Scottish Maritime Heritage: S.S. Sir Walter Scott - From The Heritage Trail, this page provides a comprehensive history of the S.S. Sir Walter Scott from its launch on 31 October 1899 to the present day. Hail to the Chief - From Music, Theatre & Dance, the Library of Congress's digital library of the performing arts, this page narrates how James Sanderson's setting of 'The Boat Song' from The Lady of the Lake eventually became the official musical tribute to the US President. The Literary Encyclopedia - Detailed entry by Susan Oliver (Essex/Wolfson College, Cambridge) on The Lay of the Last Minstrel, outlining the poem's compositional history, plot, and critical reception, and providing a critical commentary. Notes the poem's importance in creating a vogue in Britain for lengthy, historical verse romances that prefigured the rise of the Historical Novel and incorporated the already fashionable genre of the Gothic Tale. Wikipedia - Very brief entry (as at March 2007) offering a plot outline and list of external links. Branxholm - From GENUKI, the UK and Ireland genealogical site, this is an entry from the Imperial Gazetteer of Scotland (1868) on Branxholm (or Branxholme or Branksome) Castle near Hawick, ancestral seat of the Scotts of Buccleuch. Quotes Canto I, stanzas 1-5 of The Lay of the Last Minstrel, depicting a medieval feast at the castle. Famous Scots: Michael Scott the Wizard - From Rampant Scotland, this page includes a discussion of Walter Scott's contribution to the Michael Scott legend through his role in The Lay of the Last Minstrel. Border Island, Whitsunday Islands, Australia - From the Tourist Information site of the Whitsundays, this page discusses how local place names (Cateran Bay, Mosstrooper Peak, Minstrel Rocks) derive from The Lay of the Last Minstrel, as do the names of the neighbouring Deloraine and Esk Islands. Deloraine, Tasmania - From Walkabout, an Australian travel guide, an entry on a town named after Sir William Deloraine in Scott's The Lay of the Last Minstrel. The district was first surveyed and the settlement named by Thomas Scott (1800-55), a kinsman of the author. 'An Explication of "Lochinvar"' - From A 19th-Century BritLit Web, a collaborative work-in-progress produced by students and faculty at Cedar Crest College and West Chester University, this essay by student Cheyenne DeMulder (Cedar Crest College) approaches 'Lochinvar' as 'an interesting study in human relationships and power struggles between correct roles and duties'. Lochinvar, Our White Knight? - From the genealogical Land Family site, this text traces a family connection with James Montgomery who has been proposed as a model for Scott's 'young Lochinvar'. There is a link to a text of the ballad 'Lochinvar' (sung by Lady Heron in Marmion). 'At Cheyenne' - From Representative Poetry Online, a parody of 'Lochinvar' by American poet Eugene Field (1850-1895) which transposes the action to the Wild West. 'At Cheyene' - From Joe Horn's Poetry Archive, another text of Field's parody followed by a text of Scott's 'Lochinvar' for comparison. Lochinvar - From Andy Potts's genealogical site, the Sorbie Family Page, this page provides historical information on the site of the now submerged ruins of the former stronghold of the Gordons of Lochinvar, one of whom was featured as 'Young Lochinvar' in Lady Heron's song in Scott's Marmion. There is a paragraph on Scott followed by the text of 'Lochinvar'. 'Lochinvar' Facts - From cartoonist Lochinvar Bucane's home page, this pages lists places, businesses, bands, and people named after 'Young Lochinvar'. The guest book includes further examples suggested by readers (including a cat) and a discussion of the etymology of 'Lochinvar'. 1897 Imperial - From Bicycle Aficionado Jim Langley's selection of Vintage Bicycle Ads, this advert proclaims that 'The Modern Lochinvar rides an Imperial' and depicts Young Lochinvar carrying off his bride on a bicycle pursued by other knights on inferior models. The Lord of the Isles, a poem, by Walter Scott - One of Cornell University Library's contributions to the Making of America (MOA) digital library, an anonymous review of Scott's poem The Lord of the Isles from the July 1815 issue of The North American Review. Sir Walter Scott and Alexander MacAllister of Strathaird - An essay by Robert M. McAllister from the Clan McAlister of America site on the references in Scott's poem The Lord of the Isles to the Cave of Strathaird on the estate of Alexander MacAllister. A Brief History of Western Culture - Brief but cogent comment on Scott's poetical works in general and on Marmion in particular. Argues that where we think of Scott as 'one of the first authors to have a historic sense of the differentness of the past', Marmion appears to be acted by people of his own time in costume. Written while mainland Europe was a battleground, it is a statement about modernity. Also briefly analyzes Scott's influence on Whitman who took from him his 'particular conception of a national poet as someone who set his marginal nation on the map of civilized awareness, and whose own copious energy instantiated his nation’s potency'. The Literary Encyclopedia - Detailed entry by Susan Oliver (Essex/Wolfson College, Cambridge), outlining the compositional history of Marmion, its plot, and critical reception, and providing a critical commentary. Locates the poem's importance in capturing a high moment of neo-chivalric historicism, in its influence on other Romantic writers such as Byron, and in its quintessentially Romantic concern with the conscience of the main character as he struggles between self-interest and the desire for virtue. Wikipedia - Detailed entry (as at June 2008) providing a brief compositional history, plot summary, discussion of the poem's reception, and list of external links. The Battle of Flodden Field, 9th September 1513 - From David Simpson's North East England History Pages, this page quotes Canto VI, stanza 19, lines 1-21 of Marmion. Folklore and Legends: St Hilda - From the Whitby-Yorkshire site, a page relating the legendary origin of the ammonites or fossilised mollusc shells often found along the North Yorkshire coast. St Hilda is said to have prayed for all the snakes of the neighbourhood to lose their heads and turn to stone. The page quotes Scott's allusion to this legend in Marmion, Canto II, Stanza 13. Arthur Sullivan' Overture on Sir Walter Scott's Poem of Marmion -From Meinhard Saremba's Arthur Sullivan site, this page contains an analysis (in English with a German introductory text) of Sullivan's overture Marmion (1867, revised 1874). 'Flodden Field' by Sir Edward Burne-Jones - From The Victorian Web, a colour image and description of Burne-Jones's 1882 painting Flodden Field, for which one of the sources was Scott's Marmion (a section of which is quoted). Alnwick, Wooler and North Northumberland - From David Simpson's North East England History Pages, this page includes a paragraph on Norham Castle which quotes the description of the castle in the opening lines of Scott's Marmion. Crichton Castle - From Earl of Bothwell, a site dedicated to restoring the reputation of James Hepburn, 4th Earl of Bothwell (and third husband of Mary Queen of Scots), this historical page on Crichton Castle, near Edinburgh, quotes descriptions of the castle from Marmion (whose eponymous hero was fictional owner of the castle) and describes how the poem's success revived interest in the castle and led to its partial restoration. Facts about Durham City - From David Simpson's North East England History Pages, this page includes an extract from Marmion describing how the monks of Lindisfarne fled the Vikings and bore the relics of St Cuthbert to Durham (via Chester-le-Street). An accompanying page on Durham Castle quotes Scott's lines in praise of the 'grey towers of Durham' from Harold the Dauntless. Holy Island (Lindisfarne) - From David Simpson's North East England History Pages, this page includes two extracts from Marmion describing a) 'Pilgrim's Way', the causeway to Holy Island b) the legendary craft of 'St Cuthbert's Beads' on St Cuthbert's Isle. Marmion and The Most Dangerous Place in England (Norham Castle) - From Mike's Genealogy Site, a family and local history site centring on the village of Norham, Northumberland, this page quotes the description of Norham Castle in the opening lines of Marmion and discusses the role of William Marmion in resisting Philip Moubray's attempts to capture the castle. North Durham: Chester-le-Street and Washington - From David Simpson's North East England History Pages, this page quotes an extract from Marmion describing the flight of the monks of Lindisfarne from Viking raiders, and goes on to discuss their subsequent foundation of a bishopric at Chester-le-Street. Shore of the Saints - From David Simpson's North East England History Pages, this page on the coastal monasteries of Northumberland quotes two extracts from Marmion on the legend of 'St. Cuthbert's Beads' and Viking raids on Lindisfarne. The Literary Encyclopedia - Detailed entry by Susan Oliver (Essex/Wolfson College, Cambridge), providing an excellent account of Scott's collection of materials for Minstrelsy of the Scottish Border, his stance on the contemporary argument over the status and social function of minstrels and bards, his editorial practice, and the Minstrelsy's publishing history. Oliver argues that the Minstrelsy can only be understood if considered as a work running through five main editions between 1802 and 1830, and hence across Scott’s entire career as a writer. Quellen von Wilhelm Hauff zu 'Die Geschichte von dem Gespensterschiff' - A German-language essay from Herbert Hubert's Lesekost site on Wilhelm Hauff's sources for his tale of the Flying Dutchman. These included Scott's Rokeby, canto II, stanza 11 to which there is a link at the foot of the page. 'Rokeby' by J.M.W. Turner - From the Cecil Higgins Art Gallery, an image of a watercolour by Turner, depicting a narrow gorge between Rokeby and Mortham, Country Durham. On two boulders in the foreground, Turner has inscribed eight lines from Scott's Rokeby (1813). The painting was commissioned by Walter Fawkes of Farnley Hall in 1822 as one of seven watercolours to illustrate a volume of selected verses by Scott, Byron and Moore. Teesdale and Barnard Castle - From David Simpson's North East England History Pages, this page has paragraphs on Woden Croft, the River Balder, and Rokeby Hall, with descriptive quotations from Scott's Rokeby. A Brief History of Western Culture - Brief but cogent analysis stressing three passages of Tales of a Grandfather which merit particular attention: Scott's discussions of the origins of social ranks (ch. XXXIV), of the Glencoe Massacre (ch. LVIII), and of the Highland Clearances (ch. LXXXVII). A Chat with Magnus Magnusson - From Electric Scotland, an interview granted by Magnus Magnusson to Frank R. Shaw, in which he defends his decision to structure his book and radio series Scotland: A Story of a Nation around Scott's Tales of a Grandfather. Scotland: A Story of a Nation - From Electric Scotland, a review by Frank R. Shaw of Magnus Magnusson's Scotland: A Story of a Nation, which defends Magnusson against criticism that he drew too extensively on Scott and goes on to praise Scott's own treatment of Scottish history in Tales of a Grandfather.